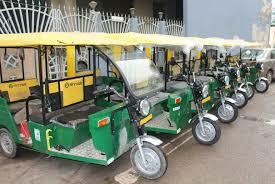 PUNE: With the battery-operated e-rickshaw project failing to garner adequate interest in Pune, even almost a year after the plan was announced, the regional transport office (RTO) has now decided to intervene. The RTO plans to hold talks with the Pune Municipal Corporation (PMC) for the development of basic infrastructure for these vehicles. “The response has been very poor. While we still believe that the manufacturers should be responsible to ensure sales of their vehicles, we can initiate talks with the civic body for some basic infrastructure,” an official said. The Pune RTO had first come up with the plan in July 2017, and in August, the authorities had finalized 14 routes on which these vehicles could ply. “The Centre has been talking about promoting e-vehicles, but the fact is, we have seen negligible registrations in the city. One of the basic issues is the lack of charging points. Without charge, these vehicles can suddenly stop,” another official said. The manufacturers, meanwhile, said some concrete steps needed to be taken. “The routes that have been approved are very short stretches and people who want to buy these vehicles do not see much profit. Instead of approving the routes, the RTO should have come up with a list of routes in which e-rickshaws shouldn’t be allowed,” said a business development manager of an e-rickshaw manufacturer.